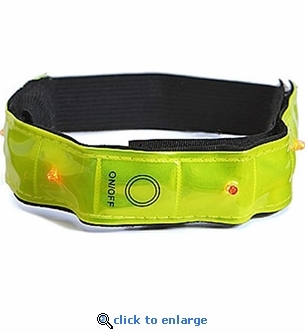 This reflective safety band with 4 LED flashing lights wraps around your wrists, ankles or arms and can be attached to belts, backpacks, bikes and more for excellent visibility at night. This innovative safety product is ideal for anyone jogging, walking, biking or working at night. Includes CR2032 lithium battery that lasts up to 150 hours. 4 red LED lights flash 150 times per minute. Size: 1" wide x 9" long. Weighs only .5 oz. with battery installed.